A recent CDC report indicates that more than 20 percent of emergency room visits related to prescription opioid pain reliever overdoses also involved alcohol consumption. Since both alcohol and prescription opioid pain medication are legal, it’s a common mistake for people to believe that mixing the two is harmless. However, drinking while taking opioids can be deadly. Polydrug use refers to mixing two or more addictive substances to heighten the effects. One drug may be the primary drug of choice or the person may abuse multiple substances equally. In the case of people who are abusing both alcohol and opioids, a dependency on alcohol is typically the first to develop. Someone who is accustomed to drinking heavily on a regular basis often finds it difficult to abstain when taking prescription opioid painkillers. Mixing the two substances results in a heightened intoxication that promotes further substance abuse. Even when someone has a valid prescription and a legitimate medical reason for using opioid painkillers, these drugs are highly addictive when not taken precisely as prescribed. You associate pleasurable feelings with mixing alcohol and opioids. You don’t take opioids unless you’re also drinking. You are drinking more and snorting or injecting opioid medication to increase the intoxicating effects. You no longer have a valid prescription for opioids, but are obtaining pills through other means. You’ve tried to stop using these substances, but have been powerless to change your behavior. You’ve lied to friends and family about your substance use. 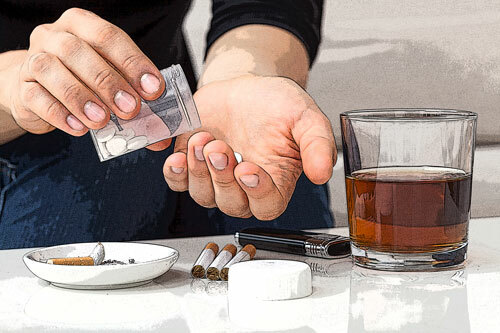 Men are slightly more likely to have a polydrug addiction involving alcohol and opiates, but this is thought to be due to the fact that overall rates of alcohol consumption are higher among men. Addiction doesn’t discriminate by age, gender, race, or socioeconomic status, so anyone can fall prey to this type of substance abuse. If treatment is not received in time, the effect of mixing alcohol and opioids can be fatal. Rates of fatal overdoses are highest in people over 40, with the CDC reporting 25.2 percent of fatalities occurring in individuals age 40 to 49 and 25.3 percent of fatalities occurring in individuals aged 50 to 59. This may be due to the fact that older adults are more likely to suffer from medical conditions that increase their vulnerability to fatal side effects. It is impossible to predict when an overdose of alcohol and/or opioids will occur and individuals who are abusing both substances will often not have the ability to recognize symptoms of an overdose on their own. To prevent fatal complications, a bystander must call 911 immediately. Emergency responders can now use a drug known as Naloxone to reverse the effects of an opioid overdose. Often sold under the brand names Narcan or Evzio, this medication works by binding to the same pain receptors that are affected by opioids and temporarily blocking the effects of prescription opioid painkillers. Naloxone’s effects are relatively short-lived, but can buy enough time for a person to get treatment at a hospital. Unfortunately, Naloxone does nothing to treat the effects of alcohol poisoning. Someone who is suffering from alcohol poisoning should be treated at a hospital. Care providers may pump the stomach, administer activated charcoal, or provide vitamins and glucose to prevent complications as the body rids itself of alcohol. There are no home remedies to treat alcohol poisoning—you can’t sleep it off, take a cold shower, or drink black coffee to sober up. Someone who is addicted to both alcohol and opiates faces special challenges on the road to recovery. However, Mountain Laurel Recovery Center’s trained staff can provide the care and support necessary to break free from the burden of addiction. Both alcohol and prescription opioids can produce deadly withdrawal symptoms if the user tries to quit on their own. The risk of complications increases when both substances have been abused for a long period of time. The safest course of action is a medically-supervised detox with 24/7 monitoring of vital signs, medication to relieve painful withdrawal symptoms, and emotional support to make the transition to recovery. Detox should be followed by a residential treatment program that includes intensive counseling to address the underlying motivation for substance abuse and to promote the development of skills to prevent relapse. If detox is not followed by counseling, nearly all individuals will relapse within a short time period. A relapse following detox is very dangerous since the body’s tolerance is diminished after going through withdrawal. This means a fatal overdose can occur at a much lower level than what the person was consuming before entering treatment. If you or a loved one are struggling with addiction, please contact us today for PA opioid addiction help.